The rush to focus on the larger-capacity middleweights that were suddenly allowed under LAMS led many novice motorcyclists to ignore some excellent lightweight machines. But not for long. Soon the real charm and practical benefits offered by the best of the traditional learner bikes was again recognised, stimulating fresh demand. And Honda’s lovely lightweight naked, the VTR250, is a perfect example. Honda’s shameless appropriation of the Ducati M900 Monster’s styling for the VTR was a masterstroke. If anything the Japanese giant improved on the Ducati’s styling, giving the VTR a less hunkered-down look and trading off some of the Ducati’s steroidal muscularity for a touch of sleekness. The welded steel-tubing truss frame is the standout feature of the styling, reminding former structural-design students of the unique combination of stiffness and lightness in a welded truss. The large round headlight, fuel-tank shape and the lines of the seat and seat cowl are faithful to the Ducati template. The 248cc, liquid-cooled, 90º V-twin engine incorporates the swingarm pivot in the rear of its cases (like the VTR1000 Firestorm). A non-adjustable 41mm conventional fork and a pre-load adjustable monoshock handle suspension duties. A single 296mm front disc with twin-piston caliper and a 220mm rear disc provide braking. Honda’s reputation leads you to expect a high standard of finish and attention to detail, and the VTR doesn’t disappoint. For a compact 250 the VTR’s ergonomics and seat comfort work well for a range of rider sizes – though for tall riders (over the old six-foot or 183cm), probably only for short trips. The low 760mm seat height and minimal 139kg dry weight make the VTR easy to handle in all situations including low-speed manoeuvres. It’s a real confidence-booster for novices. The shortish reach to the ’bars has most riders leaning forward slightly in a comfortable posture. Clutch action is light and progressive, as is throttle response from the carburettor-fed engine. Gearshift action is smooth and accurate. Contrary to what you might expect the gearbox only has five speeds, but you hardly miss a sixth – the only time you could use it would be to reduce engine rpm when cruising at highway speeds. Brakes are perfect for a LAMS bike – plenty of progressive power on tap without excessive initial bite. The lack of span-adjustable clutch and brake levers is disappointing given the bike’s appeal to young riders and women riders in general. The sweet motor delivers lively, largely vibration-free performance – while it doesn’t rev to stratospheric levels like little four-pot screamers, it rewards riders with a strong mid-range and the appealing off-beat V-twin sound and feel. The 13-litre tank provides a safe touring range of around 300km, thanks to the VTR’s miserly thirst. Suspension performance and handling are competent and predictable. It’s a neutral steerer with plenty of cornering clearance. When pushed hard by experienced riders, fading suspension damping signals that you’re approaching the bike’s limits. But hey, by then the little VTR has probably rounded up a couple of lardy middleweights mid-bend. The condition of a particular example will be way more important to your choice than any of the detail changes that occurred during the carby-VTR’s 10-year model run. It was superseded in 2009 by a substantially changed VTR with a fuel-injected engine and modified chassis. 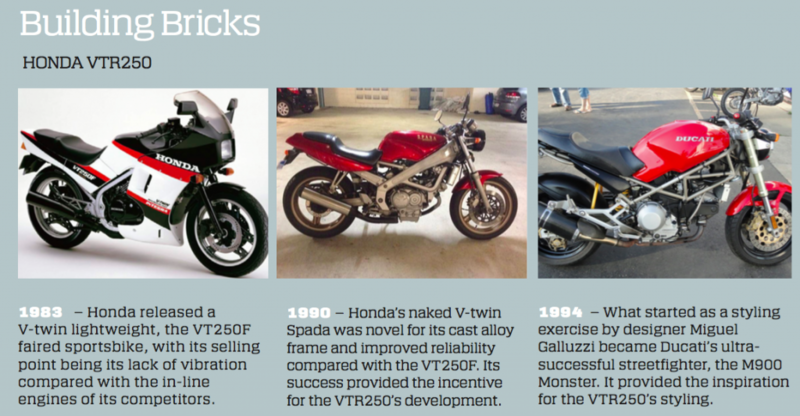 Summing up: A VTR250 is a good looker, a well-engineered bike that’s reliable and comfortable and cheap to run. It’s a piece of cake for learners to ride. But learners and P platers, be warned – leave the VTR’s keys lying around at your own risk, as experienced mates and rellies will grab them. Anyone who likes motorcycles enjoys a spin on a VTR. As well as relying on Honda’s deserved reputation for quality and reliability, VTR owners are reassured by the availability of parts and service from ‘Team Red’s’ nationwide dealer network. These little gems are pretty much bulletproof given decent maintenance, so you’re basically checking for damage or signs of neglect. As always with Hondas check for rectifier/regulator issues. Grey-import examples should come at a decent discount to compensate for any parts availability issues. Adjust your offer to cover worn consumables like chain, sprockets, steering-head bearings and brake pads, also brake rotors close to minimum thickness. The ideal prospect is a low kays example with a full service record. The VTR250 is a reliable machine that’s perfect for DIY owners to look after in terms of all basic maintenance. Being a naked it offers good access for routine oil and filter changes at 6000km intervals – changing the old-school, cartridge-type oil filter is a bit labour intensive, because it lives inside the sump. Valve-clearance checking and adjustment – required at 12,000km intervals – is a DIY-friendly screw/locknut set-up. Sparkplugs should also be replaced each 12,000km.